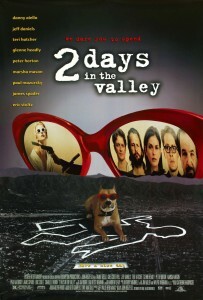 2 Days in the Valley is a drama/thriller/comedy written and directed by John Herzfeld. It follows a group of people whose storylines are drawn together by a murder. Eric plays Wes Taylor, a vice cop who wants to work homicide. Jeff Daniels plays his partner Alvin. The film was released in theatres in September 1996 and on DVD in 1997. John Herzfeld deftly welds together a multitude of subplots– a loser hitman and a cool assassin involved in an insurance scam; a washed-up director, turned suicidal, if only he had someone to care for his beloved dog; a snooty art dealer, wracked by kidney stones, cared for by his devoted assistant; a grungy deranged vice cop, now partnered with a fresh-faced rookie; and two beautiful and jealous women entangled in their deadly scheme–into a spoof of the crime thriller genre. The anamorphic widescreen treatment here is long-overdue, but otherwise its quality, presented in 2.35:1 aspect ratio, is neither spectacular nor deficient. The picture is clear, albeit a little soft in a few spots. Aside from some climactic gunshots that get surround-sound action, the Dolby Digital 5.1 mix is modest. It doesn’t matter much; this is a dialogue-driven film. Audio tracks are available in English, Spanish and French, with optional subtitles in English, Spanish, French and Portuguese.